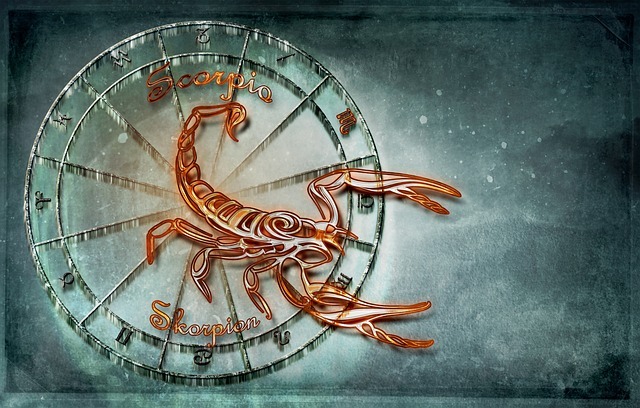 Weekly Scorpio horoscopes for the week ending 26th May 2018 – with a difference! We tell you the planetary weather, and you decide how you will plan around it! Will you take an umbrella? Will you dance in the rain? Or will you fall in a puddle? Same weather, different outcomes! This astrological weather report for the week ending 26th May 2018 is for people with predominantly Scorpio energies in their chart. For example, this could be if Scorpio is your sun sign, rising sign, or moon sign. By seeing what zodiac sign the moon is traveling through, we can work out which areas of life you will instinctively reflect upon for a day or two, and how the energy “weather” will interact with you. The moon in Leo draws your instincts to focus on your life goals. It could be that a relationship has taken an unexpected turn, and you are reassessing where you are going in life. Additionally, you may feel as though family members demanding attention aggressively oppose your goals. Possibly, this feels in contrast to how you are feeling generally good about yourself, so be careful that your ego isn’t taking any gambles. Also, you are entering a period whereby your intuition seeks to move forward with overcoming some of your deepest fears about the chameleon nature of the universe. When the moon enters Virgo, you feel instinctively drawn to your friends and your community. It could be that you have an unexpected interaction while with a group of people that leads you to connect with someone new or deepen an existing relationship. Nevertheless, you still feel haunted by many of your fears about the risks of intimacy. It could be that you have an opportunity to meet a romantic partner from a different culture. But you have to take a leap of faith. The moon then travels into Libra, and you instinctively feel as though you must turn inward for solitude. However, this is beneficial, as you can pay attention to the demands of family members, which in turn serves to alleviate many of your fears. Still, you may feel a little anxious at turning your attention from a new love interest, or the deepening of an existing relationship. At this time, you are also entering into a period where your positive self-esteem will enable you to visualize magnificent creative expression. You will even feel fantastic about pursuing romance. As the moon enters Scorpio, you instinctively begin to focus on yourself. Consequently, this may create an unexpected conflict with a significant other. Maybe they feel that two can play at the independence game! Additionally, aggressive interactions at home may still be distracting you from expressing yourself the way you truly want to, which leaves you open to appearing moody.